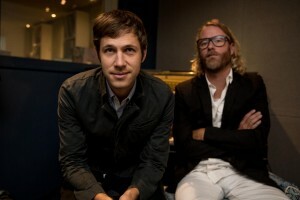 In 2014, Matt Beringer from the The National and Brent Knopf from Romana Falls formed the EL VY project. They released their debut album Return to the Moon in November 2015 via 4AD/Beggars Group. When they aren’t busy with their two other bands, they continue to work together on future music. Thanks for your time today! How’s 2016 been treating you so far? Good, but it has a lot to live up to. Last year was epic. What were some of the highlights of 2015 for you and EL VY’s music? It was trippy- hearing Return to the Moon on the radio was surreal in a wonderful way. The sold-out concerts in North America and Europe/UK were a total blast. How did EL VY first form? How did you two first meet each other? I met Matt in 2003 when my former band Menomena played a show with The National in Portland. About five years ago, he asked for me to send him some song sketches, so I sent him a boatload of hundreds. Poor sap. I understand that it took awhile before you finally came together and started making music. Was it hard to find the time when you were both busy with your other groups? Yes. I’m glad Matt made EL VY a priority in the window of time between The National’s records. If I were him, I would’ve done something smarter, like try to launch a semi-autobiographical TV show. Can you recall your first musical memory? My mom’s a beautiful singer, and the piano from my childhood is now in my living room. It’s the same piano you’ll hear on the EL VY album. The first song I got obsessed with was Axel F (the instrumental theme to Beverly Hills Cop) by Harold Faltermeyer. This may be difficult but what is your favorite piece of music? Easy. It’s This Must Be the Place (Naive Melody) by Talking Heads as performed on the Stop Making Sense concert-film. Is there one piece of music that really inspired you to be a musician? Hard. Depeche Mode’s album Violator. How is EL VY’s sound and direction different than your two other groups, The National and Ramona Falls? EL VY has a lightness to it that surprised both Matt and me, given our depressive tendencies. I’ll have to save the capes and eye-liner I bought for a different project. How is the subject matter different or similar? Matt writes all the lyrics to both EL VY and The National, and he’s called his lyrics for EL VY his “most autobiographical” so far. Late October last year, you released your debut album as EL VY, called “Return to The Moon.” Are you currently working on anything new now? New EL VY songs are being cooked up, but they’re on the back burner as Matt re-focuses on The National and I refocus on Ramona Falls. My manager has told me I am *not* allowed to discuss my collaboration with Taylor Swift under any conditions. Any favorite venues and/or crowds lately? Our gig in Manchester, England felt unhinged. Matt waded into the audience and some bloke almost stole his glasses. We loved it. How do you balance these shows with your other band tour dates? Does it ever get overwhelming at all? Nothing that can’t be cured by massive amounts of ego. Can you talk about the videos you’ve recently released for “Sad Case/Happiness Missouri”? How creatively involved were you both with them? Where did the idea for it come from? We had access to a vacant office building, and about 45 minutes of free time in between rehearsals, so we kidnapped our lighting designer Ben Krall and he filmed us. Blair Witch style. John Grant, his album Pale Green Ghosts is great. What musicians continue to inspire you year after year? Newer work by PJ Harvey and Karl Blau continues to astound. I’m always in awe of early Sly and the Family Stone, The Zombies (Odessey and Oracle), and Talking Heads (Remain in Light). An Interview With Singer-Songwriter, JOSHUA LUKE SMITH!